Apparently in Korea is has become a fad to get out your digital camera and pose as a corpse. What fun! And there you wither, decay, and rot. And then they bury you six-feet deep. And then things start to happen to you. They’ll make a horrid mess of you! And oozes out like whipping cream. [Spoken] Darn, me without a spoon! This morning I got an email from a music-loving friend of mine that informed me of some sad news. 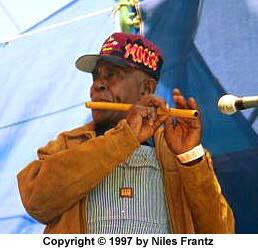 Apparently, legendary bluesman and cane fife player, Otha Turner passed away last Thursday the 27th of March. His death overshadowed by that of a particular children’s television show host. Otha Turner and the Rising Star Drum and Fife Band played a style of “blues” called American drum and fife music. Its influences trace most directly to both the drum corps of the Revolutionary War and traditional African music brought to America by slaves. I discovered Otha’s music a couple of years ago from some random zine I can no longer remember the name of. What I like most about Otha music, in addition to it’s simple but driving beats and southern man-of-the-earth feel, it was great to party to. In fact Otha threw picnic parties every summer for whomever wanted to attend. Otha and friends would roast goat, drink margaritas, and play music. The summer I first heard Otha I brought his CD to all the parties I went to. My friends with an interest in music (and most of those who didn’t) always got their interest piqued when they heard it. If you haven’t heard Othar Turner yet I recommend you do so. Try downloading (left click) some of his tunes from here, here, or here.